Quake might be one of the fastest shooters ever made – but the changes id have wrought ahead of Quake Live’s Steam release are happening all-too-quickly for players who’ve been hopping about the same arenas since 1999. Loadouts, item timers and an auto-hop mechanic have all been introduced in an effort to bring in players. But why the sudden recruitment drive? “While Quake will always be a home to the competitive base, we have often longed for a wider audience who could experience, appreciate, and fall in love with all that it has to offer,” explained id. id believe the update has left Quake Live more like a “modern shooter”. The developers pointed out that longtime players will be able to circumvent the new changes via a ‘Classic’ ruleset. 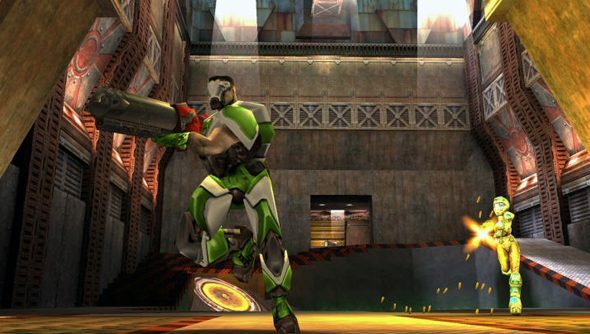 All of Quake Live’s public Duel servers will run in Classic mode, and players can host more of them using the subscriber-only ‘Create Match’ option. But they hope that even decade-long Arena devotees will see the value in the update. Quake Live players can now pick the primary and second weapon they spawn with, making it easier for new players to learn the ropes and find a favourite. A low initial ammo count means they’ll still be forced to roam the map for pick-ups, however. New item timers relay the same information about weapon respawns that veterans have in their heads – and auto-hopping will enable new players to get the hang of general movement. Is the plan sound, do you think? Or might id have better saved their new ideas for a new shooter without Quake’s deeply entrenched playerbase?